as you must’ve noticed in the past few weeks the frequency of the updates on the website has lessened. I am very much sorry for that. Since I am in my final semester of graduate school things have been really crazy for me and it won’t get any better in the upcoming weeks. I am currently working on my diploma thesis and will have to add studying for my final exam soon. This is all very stressful and demanding, and because of that I haven’t been able to post many news on the website. Add the time difference to that – I don’t think I’ll be able to stay up the whole night to watch the few more games left in the Flyers season. Since the pressure will grow as the exam will be drawing near I’m afraid I won’t have time for SimonGagne.com at all. I hope you can understand that. Remember, this is not a goodbye! It’s more of a see you soon I just felt the need to give you an explanation of what is going on and why there have been so few updates recently. Thank you again for understanding and I’ll be seeing you soon! New design & Simon signing! I’m really happy to end this short “hiatus” that the website was on for the past week and welcome you to the fresh new design! It was a pleasure to dress the site into orange & black so I hope you like it. I kept the previous theme though because I find it very user friendly, clean and neat. Of course you can expect the regular updates now as you are used to! Starting now! Shortly after the Flyers Wives Carnival, where you could meet the Flyers, among whom was also Simon, there’s another opportunity for you to meet him! Sports Vault is organizing a Simon Gagne signing this weekend. It will take place at Sports Vault, King of Prussia Mall Location, on March 16, 2013, from 4:30-6:00 pm. You need to buy tickets though to get the access. All important infomation can be found here! I’m sorry I’m slacking on the updates but today I am leaving for the States and it required lot of my time and energy in the last couple days. That being said, due to the long flight etc. I won’t have access to the internet until tomorrow night so there won’t be any updates, unfortunately. I do apologize but I hope you’ll keep visiting! Thank you for your patience! I’ll see you very soon! SIMONGAGNE.com celebrates 2nd birthday and joins Facebook! today it is exactly two years since this website, SimonGagne.com was launched. Many has changed since that day and I can only hope it was just for better. I hope that everyone who found themselves here enjoyed their time and wanted to return, maybe even regularly. This site has seen Simon’s ups as well as downs – Eastern Conference Finals with the Lightning, the scary injury in said playoffs, his way to LA, his injury that sidelined him for long months (here I would like to remember the “Get Well Soon” project and thank everyone who participated) and also his journey to his first Stanley Cup. It has been amazing and I’m glad I could be here, posting updates, news, pictures, videos… I hope you enjoyed it as much as I did! I know there’s still a lot that can improve and I can promise you that I will try to work on that. I will try to make SimonGagne.com even better. I would love to say huge thank you to everyone who showed support to the website, who visited once or repeatedly, I appreciate all of you! Because, as you know, without you this website would be pretty much pointless. Again, thank you everyone! Here’s to the next two years! 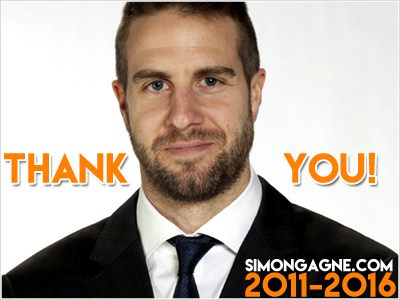 PS: On this occasion I have decided to finally open a Facebook Page for SimonGagne.com. If you like SG.com, show it! Hello, dear visitors, hockey fans, Simon Gagne fans and all good people that found their way to this website. First, I would like to take a moment to thank everyone who ever paid a visit here and even bigger thanks to everyone who keep coming back. It’s that more special given the fact that we don’t have a hockey season right now and it doesn’t seem we will have any time soon. That of course is a reason why there’s so few updates and the website seems to be in some kind of hibernation. I promise you though, that will change once NHL hockey is back. Now, I would love to wish you all Happy Holidays! I hope you get to spend these lovely days the way you want to, with your loved ones, happy and most of all healthy. 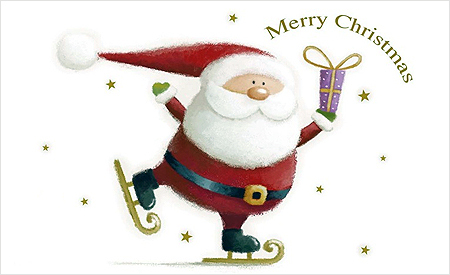 May you find under the Christmas tree what you wished for and may your year 2013 be filled with love and joy. Hopefully I’ll see you soon with some hockey updates! I love you and thank you again for giving this site a purpose.